Acharya Dharmendraji Maharaj, Mathadhipati of Jaipur Samartha Ramdas Swami Math visited the Memorial with Shri Hirjibhai Karani, Dr. Vaishnav, Akshay Thakker etc. and very much pleased to see the entire Memorial, Its cleanliness and the Portraits of Nationalist, Revolutionaries & Martyrs with details at India House. Also , 3141 visitors, 16 Primary School and 2 Secondary School visited at memorial in week of 23/03/2012 to 28/03/2012. 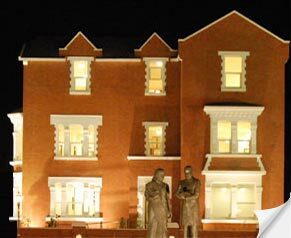 April 8, 1929 - Britishers arrested Bhagat Singh and his friends. April 8, 1857 - Mangal Pandey was captured and hung till death. April 11, 1869 - Kasturba Gandhi, Mahatma Gandhi's wife worked with him for many years. She was a leader of Women's Satyagraha for which she was imprisoned. April 13, 1919 - The traditional festival of Baisakhi, at the Jallianwala Bagh near the Harmandir Sahib in Amritsar, where British Indian Army soldiers opened fire on an unarmed gathering of men, women and children. April 18, 1859 - Britishers caught hold of Tatya Tope and hung him to death. Thursday, March 15, 2012 - Kranti Teerth is now also attracting bird watchers for watching large numbers of Demoiselle Cranes (Anthropoides virgo) known as "Kunj" also. Since last two months approx. 1500 to 2000 bird cranes selected safe space at Krantiteerth ground for their stay. Thursday, March 22, 2012 - "Arjun Bhagat" Film Shooting done by M/s. Nice Films Production from Motakandagara Tal.Mundra (Kachchh) with all their production staff and Renowned Artists. Thursday, March 29, 2012 - Senior VHP Leader Mr. Jaydeepbhai Patel from Ahmedabad visited the Memorial with other dignitaries. 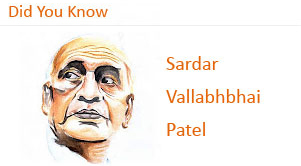 Sardar Vallabhbhai Patel, popularly known as a ‘Man of Steel’, was born on October 31, 1875 at Nadiad, Gujarat. He passed his high school studies in Nadiad and came out with a strong desire to become a lawyer. When he was eighteen years old, Patel's marriage was arranged with Jhaverba, a young girl of twelve or thirteen years from a nearby village. Sardar started his legal practice in Godhra and at the age of 36, he went to England for further studies. In 1920, he was elected president of the newly formed Gujarat Pradesh Congress Committee - he would serve as its president till 1945. Patel was a senior leader in the Constituent Assembly of India and was responsible in a large measure for shaping India's constitution and in post-independence era and even today, he is remembered as the man who united India. After suffering a massive heart attack (his second), he died on 15 December 1950 at Birla House in Bombay.